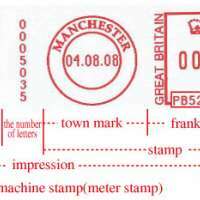 A meter stamp, or meter mark, is the impression made by a postage meter machine that indicates that postage has been paid on a letter or parcel. Meter stamps are widely used by businesses and organisations as they are more efficient than using postage stamps. Meter stamps are not adhesive postage stamps in the normal sense, although they may be printed on adhesive labels before being applied to mail. Meter stamps are normally in red, although a variety of colours are found. The international use of meter marks was approved by the Universal Postal Union in 1920, effective 1 January 1922. The blue self-adhesive sticker is called Airmail Etiquette and is a label used to indicate that a letter is to be sent by airmail and has no monetary value. The vertical number, 0070349 is the running number for mail processed. The circle is town mark information, London Northwestern District 1 (Head District) and was processed on 30 July 2012. The frank (meter) says it is from Great Britain and postage has been paid with the amount of £3.88 and PB525574 is meter's serial number.